For many, imaging a family vacation or getaway just wouldn’t be complete without their four-legged family members. 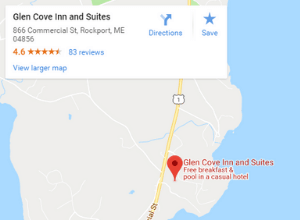 Glen Cove Inn and Suites has pet-friendly rooms that are perfect for you. Dog-friendly rooms are specifically designated and offer comforts for everyone in the family – including Fido. You’ll find a pet bed and two pet food and water bowls. Right on the property is access to the Ocean View Walking Trail – a 1.5 mile loop with ocean views. And you’ll get to experience the full list of amenities from our heated outdoor pool to our better-than-continental breakfast buffet with homemade parfaits, muffins, scones, build-your-own-waffles and more. We know that people who travel with their pets have well-trained pets. Guests traveling with pets are reminded that pets should be on a leash or in a carrier when outside of their room and that pets should not be left unattended in the room. Please alert the front desk if your pet has an accident so that it can be taken care of immediately. And don’t forget to pack pet essentials to make the trip easier – a comfort blanket or towel, foods, toys, medication, a leash and collar. The Pet-Friendly King Room is located in the main house and features a king-sized bed and private bath. Pet bed, two food and water bowls, and special paw towel.